While the Hepburn Collection cannot project those qualities as fully as the iconic "Audrey" who inspired its name, we did think of her simple beauty when we set out to design this tasteful assortment of bathroom furniture. The 73 inch vanity combo is layered with a sumptuous Dark Chocolate finish upon the solid ash wood frame. Added premium materials like a sturdy matte gold base and hardware and soft-close glides and hinges. The combo also includes a crema marfil marble top and dual rectangular undermount sinks. Match the vanity with the complementary mirror and linen tower, and Hepburn is guaranteed to delight for years to come. Elegant and Functional. Those are the criteria that guided us in creating the Riley 31 inch vanity combo. With its clean transitional lines, pristine white finish, gray quartz top, and refined brushed nickel hardware, Riley embodies a contemporary aesthetic that dazzles in multiple design settings. Generous storage features include soft-close doors and drawers with removable organizer trays. Match the Riley vanity ensemble with the complementary mirror and linen tower and you have a pretty and purposeful package. Put Riley in your bathroom and put your mind at ease. Bring a fresh, modern look into your bathroom with this vanity. With a white ceramic counter and white plywood base, this piece is very stylish. It comes with a double-door cabinet and drawers for even more room to keep items. Put a classic feel in your bathroom with this good-looking set from Fresca. Brooks 31-inch W 2-Drawer Freestanding Vanity in White With Marble Top in Beige Tan Designed with a traditional style and strong build, this vanity is a perfect choice for any bathroom. Its beige tan marble counter and white solid wood base are very easy on the eyes. Put a nice twist on your bathroom project with this classic piece from Avanity. 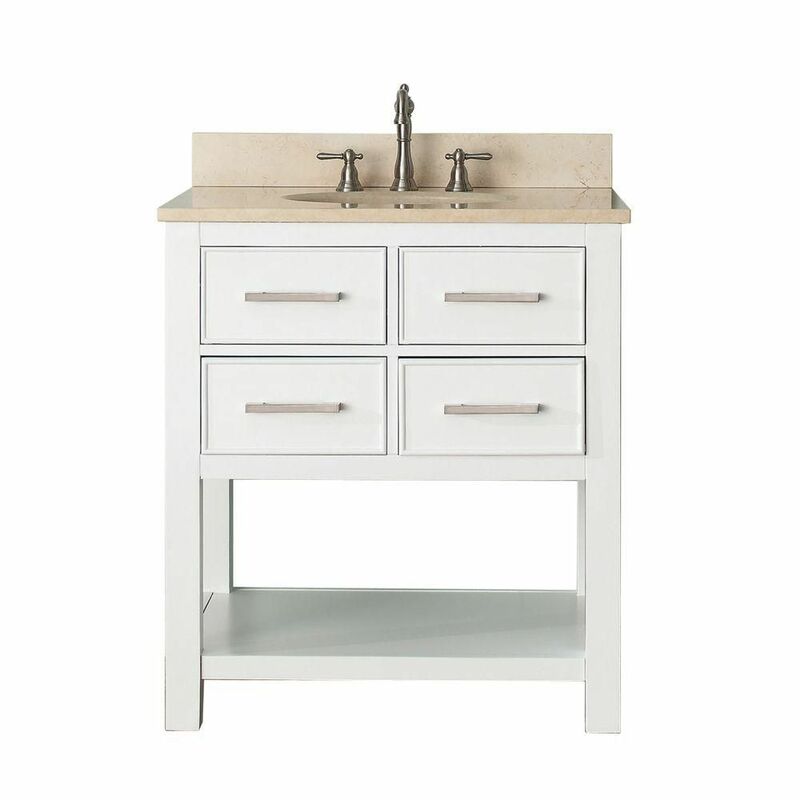 Brooks 31-inch W 2-Drawer Freestanding Vanity in White With Marble Top in Beige Tan is rated 5.0 out of 5 by 1. Rated 5 out of 5 by Mimi from This vanity is very classy looking with clean lines. We chose to install a single square faucet ... This vanity is very classy looking with clean lines. We chose to install a single square faucet with a soap dispenser. It looks great and we also bought the matching mirrored medicine cabinet. Great buy and we highly recommend.